In the 2013 Pittcon meeting (Philadelphia 17-21 March 2013) Prof. Aviv Amirav and Dr. Tal Alon will present six advanced GC-MS presentations performed mostly with the 5975-SMB GC-MS with Cold-EI. Brief abstracts of these presentations are given below (we will be happy to provide the full presentations upon request). We will be happy to meet you at our posters (240-11, 1210-6, 2180-3) or at the lecture halls after our oral presentations (1430-3, 2080-4, 2330-5) to discuss your advanced GC-MS needs and challenging applications, or any other topic. Keep reading to find out how the Aviv Analytical 5975-SMB GC-MS with Cold EI brings the next GC-MS revolution and largely improves GC-MS performance for a broad range of applications. 5975-SMB GC-MS with cold EI is based on the combination of the Aviv Analytical supersonic molecular beam (SMB) technology with the Agilent 5975 GC-MS, forming a powerful GC-MS platform. In this system the GC is interfaced with the MS using supersonic molecular beams and electron ionization is performed in a fly-through ion source. The GC eluting sample compounds are mixed with helium make up gas, expand from a supersonic nozzle into a vacuum chamber, vibrationally cooled (hence the name Cold EI), skimmed, and pass a fly-through EI ion source where they are ionized by 70 eV electrons and mass analyzed. These examples demonstrate improved MS information with Cold EI, extended range of compounds amenable for analysis, faster analysis and improved sensitivity. The harder it is to analyze the compound, the greater is the improvement gain with the 5975-SMB GC-MS with Cold EI. Currently sample identification by GC-MS is performed mostly with EI libraries. However, vital information is contained in the relative abundances of the various isotopomers (molecular ion peaks with different isotopes) which can be translated into elemental formulas of the sample compounds to supplement and complement NIST's library identifications. A novel molecule Identification software was developed based on an isotope abundance analysis (IAA) method and unit resolution single quadrupole MS data which we named Tal-Aviv Molecule Identifier (TAMI). This software, among other things, links with the NIST MS library and automatically confirms or rejects its identification. In case of a confirmation the sample identification is unambiguous since the confirmation is done by an independent set of data and method. In the case of a rejection, the MI software independently provides a list of elemental formulas with declining order of matching to the experimental data, in similarity to costly accurate mass measurements. The Tal-Aviv Molecule Identifier software is ideally applicable to GC-MS and in terms of sample identification capability it upgrades a unit resolution quadrupole based GC-MS to the level of accurate mass GC-TOF-MS. Furthermore, the combination of TAMI and the quadrupole based Aviv Analytical 5975-SMB GC-MS is superior to accurate mass GC-TOF-MS due to the uniquely obtained trustworthy molecular ions and its extended range of analyzable compounds. The TAMI software will be explained and demonstrated 'live' during the poster time with selected examples, and its operation can also be demonstrated on your Agilent Chemstation data files. Sample identification by GC-MS is usually performed with library (such as NIST) search and identification. Library identification is based on the search among available electron ionization mass spectra that provide extensive structural information via the availability of multitude of MS fragments, automatically providing compound names and identification probabilities. Improved methods of sample identification were explored using the Aviv Analytical 5975-SMB GC-MS with cold EI, an instrument based on the use of supersonic molecular beams (SMB) for interfacing the GC with MS and electron ionization of vibrationally cold sample compounds in SMB with a fly-through ion source. Sample elution is a must for sample identification and the use of short columns with high column flow rates enabled significant extension of the range of compounds amenable for GC-MS analysis while the fly-through ion source ensured their ionization without ion source degradation. Enhanced molecular ions significantly improve library search results and confidence in identification. The combined availability of enhanced molecular ions and a unique Molecule Identifier software based on isotope abundance analysis serves to confirm or reject NIST results and provide complementary elemental formulas. The combination of enhanced molecular ions and high mass fragments provides extended structural and isomer information. The combination of enhanced molecular ions, high mass fragments and high total ion count sensitivity provides lower limit of identification. The harder it is to identify the compound, the greater is the improvement gain with the 5975-SMB GC-MS. Figure 1. 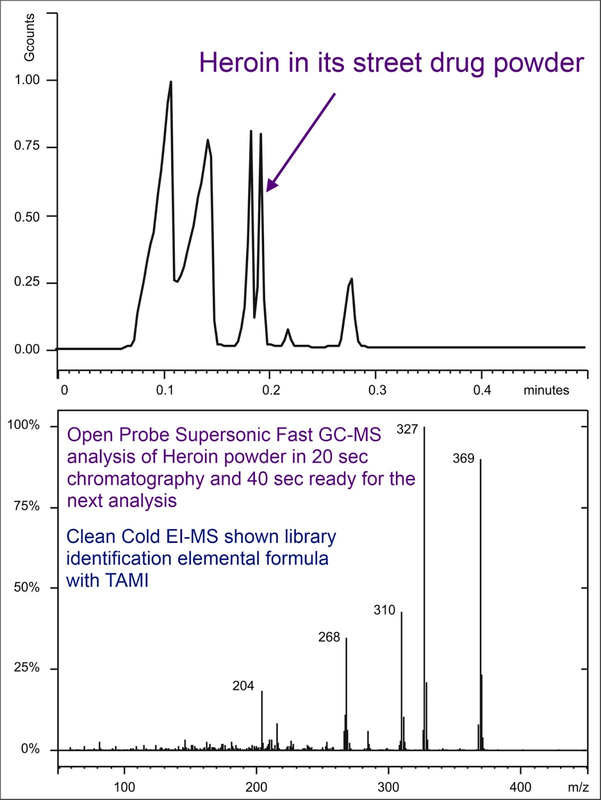 Open Probe Supersonic Fast GC-MS analysis of Heroin street drug powder which contains (in order of elution) acetaminophen, caffeine, 6-MAM, heroin, papaverine and noscapine. The powder was touched by a melting point vial that was pushed into the open probe and the analysis start button was depressed. Real time analysis with 20s separation and 40s ready for next sample is demonstrated. Note the clean heroin Cold EI mass spectrum that resulted in its high probability library identification. Forensic GC-MS analysis is of growing use and importance, encompassing diverse range of analyses including arson investigations, illicit drag analysis, explosives analysis and general unknown compound and matrices identification. 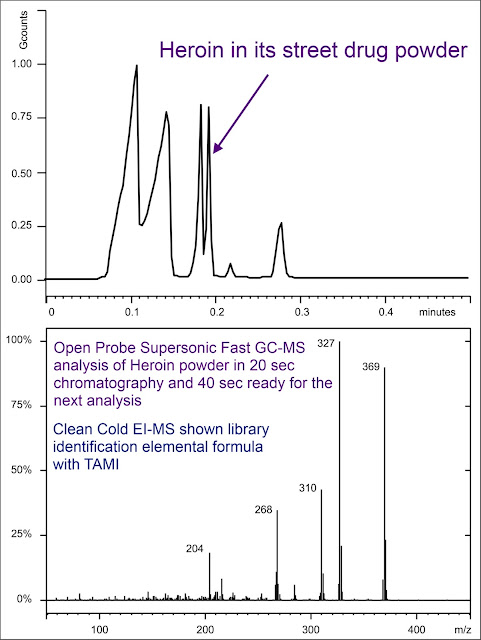 Improved forensic analysis was explored using the Aviv Analytical 5975-SMB GC-MS with cold EI, an instrument based on the use of supersonic molecular beams (SMB) for interfacing the GC with the MS, along with electron ionization of vibrationally cold sample compounds in SMB within a fly-through ion source. The 5975-SMB provides much faster analysis, enables simplified sample handling and preparation for analysis, increases the range of compounds amenable for analysis and improves sample identification via the availability of enhanced molecular ion and isotope abundance analysis software. AM2201 synthetic cannabis on herbs analysis with <3 minutes sample preparation. The innovative Open Probe low thermal mass fast GC will be described with a demonstration of its forensic applications. Hydrocarbon analysis is of vital importance to broad range of applications, yet its GC-MS analysis is confronted with difficulties: eluting low volatility and large compounds is problematic and the absence of trustworthy molecular ions often precludes proper identification. Such analysis is further exacerbated by a lack of LC and or LC-MS alternatives. The Aviv Analytical 5975-SMB GC-MS with Cold EI was used for challenging hydrocarbons analyses. This system is based on the combination of the Supersonic Molecular Beams (SMB) technology with the Agilent 5975 GC-MS, forming a new and powerful GC-MS system. In this system the GC is interfaced with the MS using supersonic molecular beams and the sample compounds are ionized using fly-through electron ionization ion source while they are vibrationally cold (hence the name Cold EI). GC-MS with cold EI enables the analysis of large oil and wax compounds, up to C74, via the use of short columns with high column flow rates. The system provides trustworthy and largely enhanced molecular ions and structurally important high mass fragments to all analytes for their improved identification. A unique novel isomer abundance analysis method is enabled and was explored for improved fuel, oil and hydrocarbon mixtures characterization. The analysis of the following samples will be described: polywax, oxygenates in wax, flesh flies wax, ants wax, flower wax, beeswax on fruits and vegetables, jet engine oil, geochemical oil samples, motor oil, insect communication hydrocarbons, Jojoba oil, Nonoxynol-9 condom spermicide oil, triglycerides in Biodiesel and more.